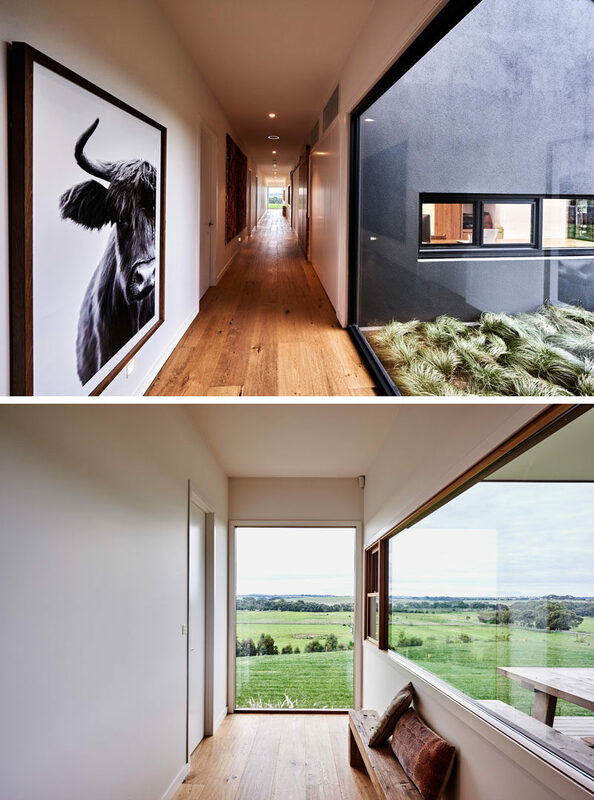 Australian architecture firm Dan Gayfer Design, have recently completed a modern ranch-inspired house that’s located in the rolling hills of Ceres, a small town south west of Melbourne, Australia. 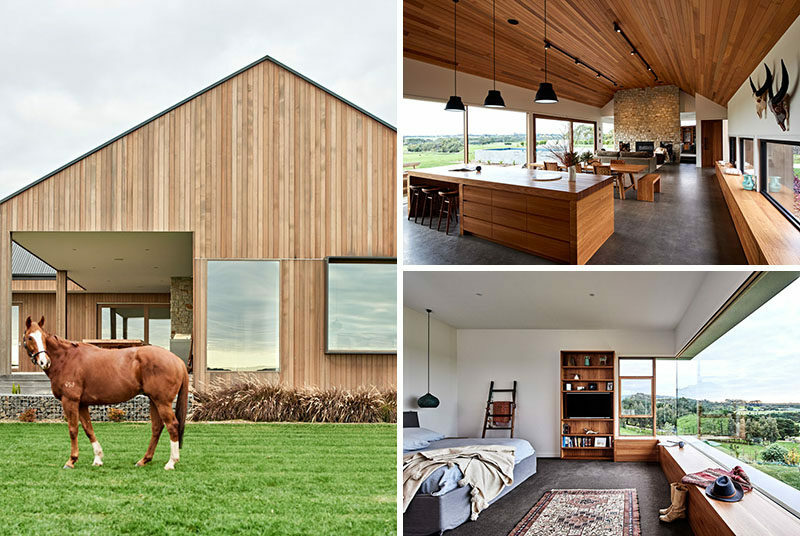 The rural home has been designed for a family with four children that enjoy sport, entertaining, farming and horse riding. Upon arriving at the house, there’s a path that leads you to the front door, while a garden has planted trees and small gabion walls. Inside, the main living area is open with a Cedar lined cathedral ceiling and due to the position of the house, large picture windows provide 180 degrees of views of the surrounding land. At one end of the large social room is the kitchen and dining area. Open wood shelving contrasts the white walls, while a large wood island has seating for six. The dining table and chairs separate the kitchen from the sitting room, and the fireplace is the focal point in the room. Off to the side of the living room on the right is the front door. 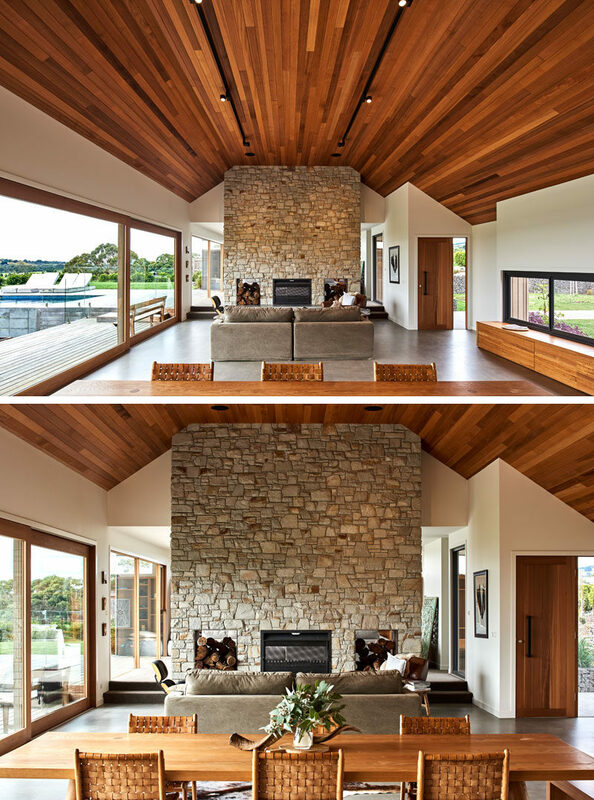 The double-sided fireplace has been crafted out of Mt Angus sandstone, while wood storage with raw steel sheeting have been positioned on each side of the fireplace. Stepping up from the main room is a living room with a built-in shelving unit to house the television. 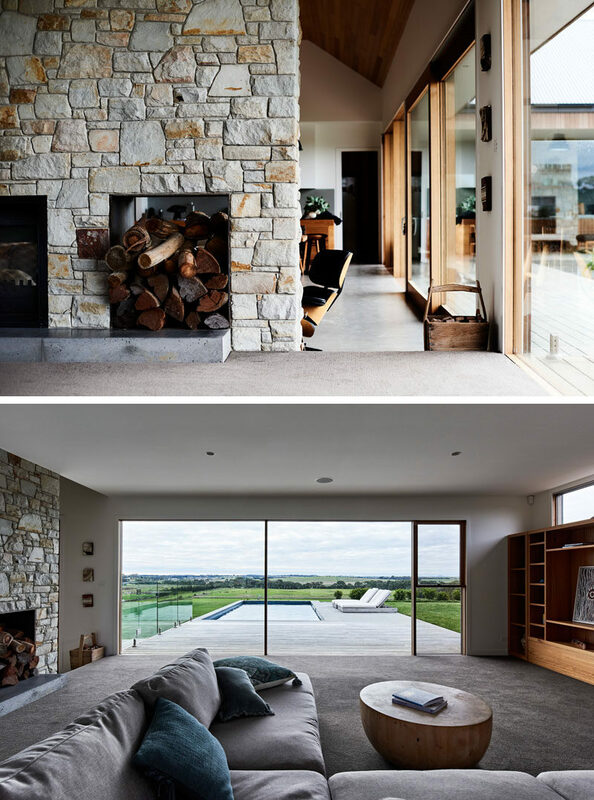 Large windows provide a view of the landscape and pool outside. 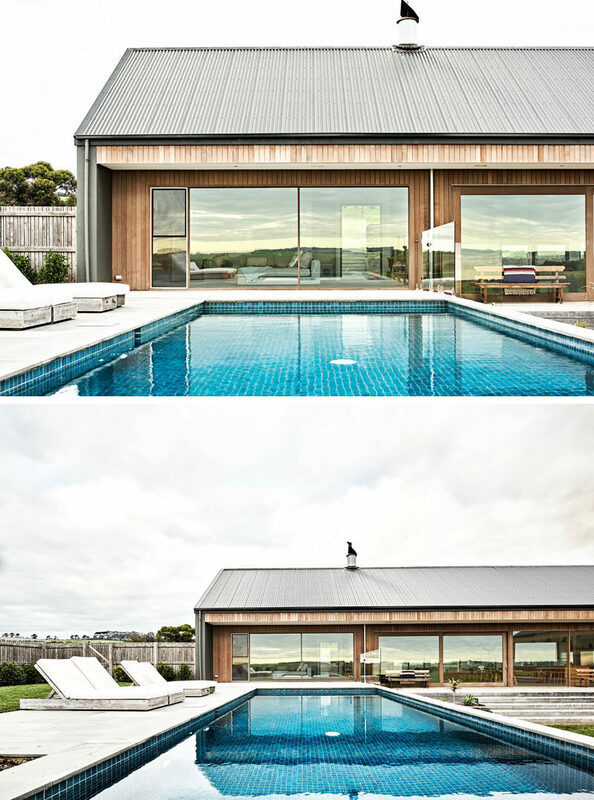 Outside, the pool sits at the same level as the interior living room, and it’s raised above the backyard. Next to the pool is a wrap-around deck that follows the shape of the house and allows for an outdoor living and kitchen area with a barbecue. Steps from the deck lead down to a large yard, and from this angle, you can see how the pool is raised up to meet the deck, and that the house has many windows, including one that has a frame that protrudes out from the wood siding. Back inside, there’s a hallway that separates the various wings of the house and leads to the bedrooms. Large windows, where possible, add natural light to the hallway that features American Oak flooring. 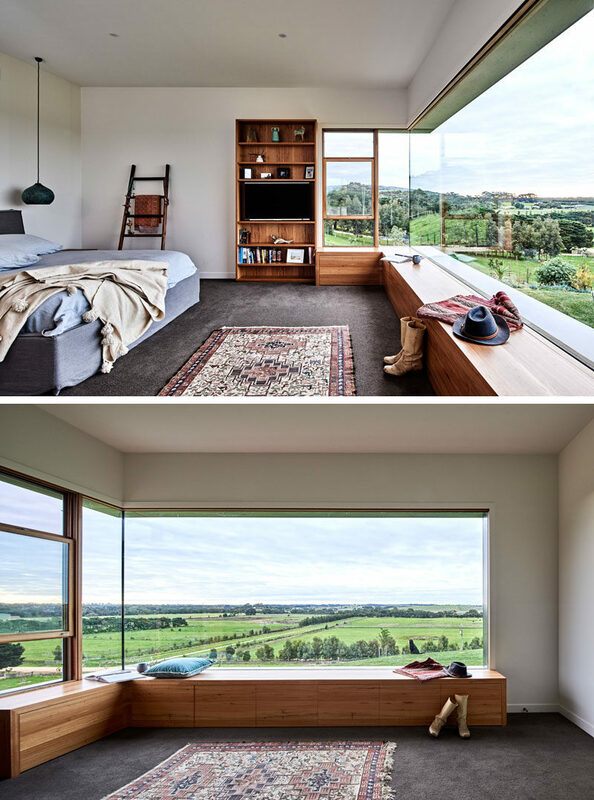 In this bedroom, a large window perfectly frames the view, while a wood bench has been built to create a space to sit and relax. Here’s a look at one of the bathrooms. 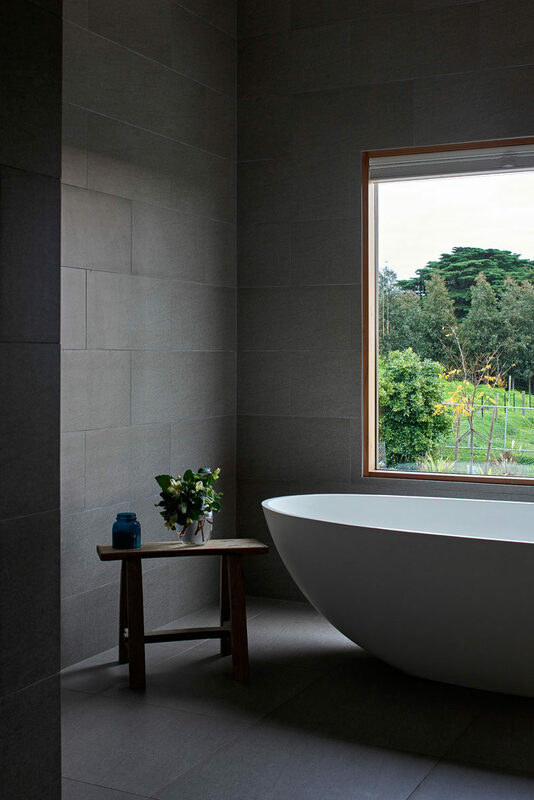 Large grey tiles have been paired with wood window frames and a white bathtub for a contemporary appearance.